Looking for a wholesome alternative to bread crumbs? When combined with vegetables and/or meat, rice works wonderfully as a stuffing. Enjoy this universal recipe in all your recipes calling for white or brown rice. The cooking method presented here maximizes taste and nutritional benefits. Recipe adapted from Nourishing Traditions by Sally Fallon. 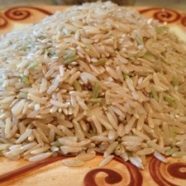 Soaking & slow cooking the rice helps to neutralize the phytic acid content and break down naturally occurring enzyme inhibitors grain in whole grain rice. Brown rice is highest of all grains in B-vitamins and also contains iron, vitamin E, and some protein. Though it contains no gluten and is therefore usually well tolerated by those with sensitivities and allergies, people with diabetic tendencies will note that it does have a high-glycemic. 1. Soak rice for 1-3 hours in water, set in a warm place. Drain rice, and sauté it in a heavy, flameproof casserole until completely dry. Meanwhile, in a separate pan, heat the 3 ½ cups combination of stock/water. Continue dry roasting the rice over medium-high heat, stirring constantly, until golden brown (do not allow to burn). 2. Once rice is lightly browned, add the hot liquid in batches (watch out for the steam! ); simmer, covered, on low for 25 minutes. Remove from heat, and stir; cover rice and steam for at least 30 minutes (and up to 1 hour) until all liquid has been evaporated and rice is cooked through. Fluff with a fork. Rice is best not refrigerated, but covered with a dishtowel and set at room temperature. If keeping more than 24 hrs, rice should be refrigerated (keeps up to 3 days when in fridge). Use in numerous dishes, including stuffed vegetables and meatloaf, as well as sautéed rice to many accompaniments.